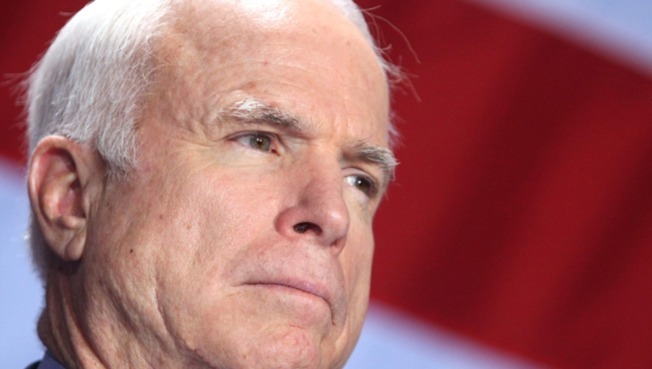 Sen. John McCain said that GM should declare bankruptcy. General Motors, the nation's largest automaker, should stop receiving bailout money and declare bankruptcy, Sen. John McCain (R-Ariz.) and another top GOP leader said Sunday. McCain and House Republican leader John Boehner said on "Fox News Sunday" that the car company could emerge stronger than ever if it hands its keys to the bankruptcy court rather than soaking up government cash. "I think the best thing that could probably happen to General Motors, in my view, is they go into Chapter 11," Fox News reported McCain said on the program. "They reorganize, they renegotiate ... the union-management contracts and come out of it a stronger, better, leaner more competitive automotive industry." McCain and Boehner both said that the Obama administration made a mistake in letting GM fail, and that future bailout funds should be doled out with more discretion and careful consideration of long-term consequences. Obama's auto advisory committee will travel to Detroit Monday to meet with bigwigs from GM and Chrysler, which has received $4 billion in bailout money. The two companies have until the end of the month to show that they can reduce debt and could use the potential federal funding to yank themselves out of financial ruin. General Motors has received $13 billion in taxpayer funding so far, and GM officials have said they'll need another $30 billion to fully save the company. The automaker lost $31 billion in 2008 and continues to plummet -- its stock lost a dismal 32 percent of its worth last Friday alone. GM officials issued a statement Friday saying they wanted to avoid bankruptcy court because it would likely mean a full liquidation of the automaker's assets.